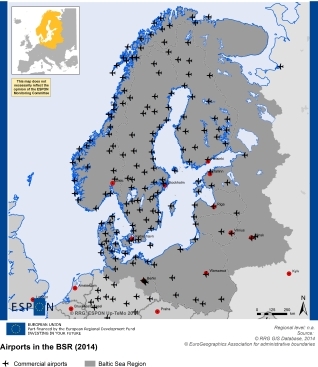 The number and spatial distribution of airports in the Baltic Sea Region differ significantly between the Northern and Southern parts. While in the Southern part of the BSR only few commercial airports are available in the vicinity of larger cities, air transport plays a bigger role in the Northern parts connecting the remote Northernmost territories to the capital cities of Norway, Sweden and Finland. However, most of the flight services in the Northern areas offer only connections between small regional airports and the airports of the capital city regions, and only few direct connections between the regional airports are in place today. Still, capital city airports represent major hubs in the global flight networks. With the diminishing passenger flows, imparity between the airports in western and eastern part of the BSR, and with the growing number of the global connections offered by the Baltic hubs, the main issue for the air transport network in the BSR is the capacity for developing services for specific destinations. At present, smaller metropolitan areas lack direct connections to some BSR capitals, as well as to other secondary metropolitan areas, which makes one-day business trips impossible. A challenge also remains to extend the air transport network to duly integrate North West Russia and Belarus, and to use the air transport to secure good accessibility of the peripheral regions. The development of airports in the peripheral or disadvantageous areas should be enhanced in an integrated way. Building a system with the regional airports linked to the BSR capital cities and metropolitan areas is of a great importance for strengthening sustainable regional development of these areas.